Shopping for a tech gift can be a frustrating experience, but it can be a lot easier if you know how to shop. To offer help, Brett Larson, the tech editor for WCBS-TV in New York dropped by The Saturday Early Show. In general, Larson likes the big name stores, especially for more expensive items like the HDTV. He finds it easier to take the item back if you find it's broken when you get it home. If you are going to buy these items (or other electronics) on the Internet, he says you should try to stick to big-name Web sites. He says it sometimes can be hard to tell what you're actually getting from some of the smaller sites. Also, Larson is not a fan of extended warranties and does not think it's necessary to purchase them for these items. Technology is changing so quickly that you'll probably want something new by the time you would need to turn to the warranty. For much more from Brett Larson, visit his Web site. This is the season for HDTV. The prices are the lowest they've ever been, and there's more and more HD content out there. HD is a bigger, higher resolution signal. You'll see more detail and a more lifelike image. In most cases, it comes with surround sound. Major networks (including CBS) have all their primetime scripted programs in HD, pay channels like Showtime have an HD channel, and there are "all HD" networks, like HDNet and Discovery HD Theater. You'll want to make sure your cable or satellite provider can give you an HD signal before you get the set. It will require an equipment upgrade and possibly a higher monthly fee. Think about your budget before you go, and how much space you have to spare for the new set. Mounted TV's like Plasmas and LCD's should be professionally installed. Sony BRAVIA KDL-32S2400 LCD HDTV retails for about $1,700 at SonyStyle Stores, SonyStyle.com or other authorized Sony retailers across the country. Film camera sales are expected to drop nearly 67 percent this year, as more of us go digital for our pictures. New cameras offer more megapixels and lower prices. Get hands-on with any camera you're thinking of buying or using to make sure it's comfortable, and the controls are easy to access. Little cameras are great, but make sure you can hold it steady to get the shot. Megapixels are basically the amount of data the camera can capture in one picture: the more megapixels, higher resolution the picture. You'll want at least 4 to print 8 by 10's without a loss in quality. Should you get 10? Not necessarily; shop for the camera in your budget. 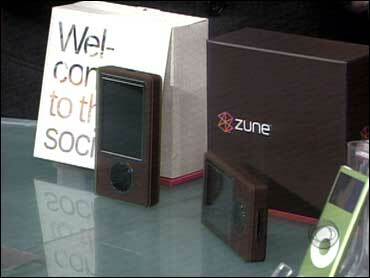 This year, the iPod from Apple has some competition from Microsoft and its Zune. But in more than 70 percent of the portable music player market, it's a still very much an iPod world. The iPod comes in a variety of sizes and colors from devices that will stuff 1,000 songs in your pocket, to one that will stuff over 10,000 songs in your pocket along with photos, movies and your favorite TV shows. The Zune, on the other hand, will play your tunes, show your photos and videos and even share content wirelessly with other Zunes near you. You can share songs you've purchased from the Zune marketplace, and receivers only get to play the song three times. You can share your photos, too. Microsoft Zune 30GB Media Player, $249.99 at Zune. Cell phones are doing more than just helping you make phone calls. There are plenty of freebies to choose from any provider. But there are also some inexpensive "SmartPhones" that do everything from check your email to keep your personal calendar close by. Again, you'll want to get hands-on with a new cell phone. Make sure it's comfortable, that buttons are usable with your fingers, and the feature set is something you really need. It makes no sense to pay for things you won't use. If you're considering switching providers, ask neighbors, friends and co-workers. Coverage maps don't give the same detail that an actual customer can give. Further information about the consumer electronics industry may be obtained at the Consumer Electronics Association Web site.